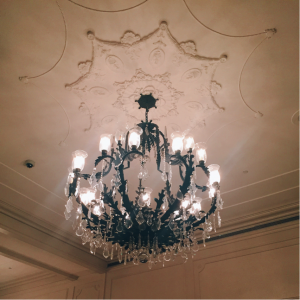 March Meeting 2017 — New Orleans! When we arrived at the hotel I had a mini scream-out-of-excitement inside. Yes, because it was fancy and was my first time seeing a bathtub since winter break, but mostly because there was a sign for the times for the APS meeting shuttle in the lobby, and people were walking around with APS name tags and fancy poster holders. I was there for the first conference of my life and this was the official stamp that I was there. The highlight of the meeting has to be presenting my summer research at the poster session. 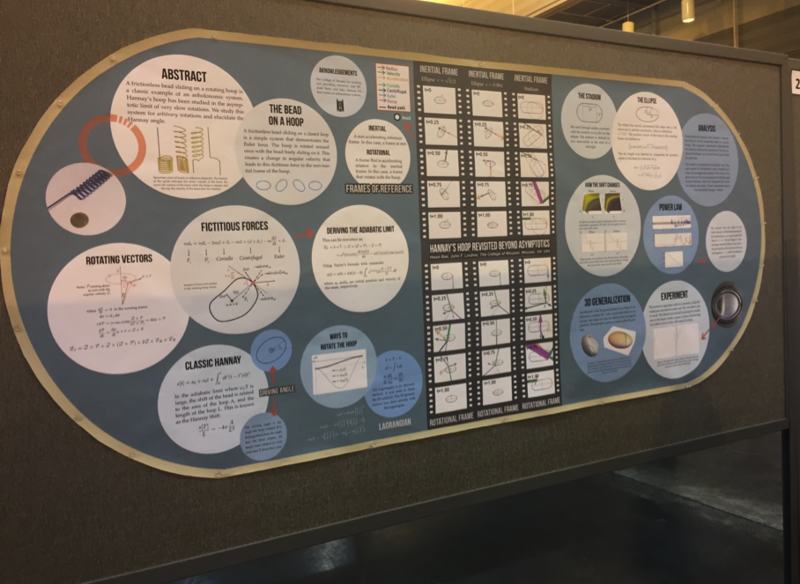 Just before the poster session started, my advisor Dr. Lindner asked me to go over my presentation for the poster, and I was so nervous that I completely froze, just standing there not saying anything. Then my phone rang so I took advantage of the excuse, and Dr. Lindner went to check out another poster while I talked. By the time he came back to check on me, the phone call was long over, and I had been explaining my summer research work to a professor from a Korean university. This was pretty awesome! Since I knew where he was from, we briefly spoke Korean, and he explained graduate programs at his school if I was interested in studying there. It was really nice to see people from all over the world come to collaborate on and discuss physics, especially since I have lived overseas for most of my life. Dr. Lindner suggested the stadium shape when I wanted a non-traditional poster but could not make an ellipse work. I think the poster turned out great! It is amazing how natural everything felt during the presentation. I stood by my poster for three hours but the time passed by so fast that I felt I could go on much longer. It was also amazing how the assumption was that I was pursuing at least a Masters degree, or even a PhD. Those people who realized I was an undergrad did so because they recognized The College of Wooster name. One person exclaimed, “Is this another one from Wooster?” and stood there looking astonished. A screenshot of my schedule. Apparently I missed the “phone books” they used to give out and had to download a phone app instead. After my presentation was over there were still so much to do. 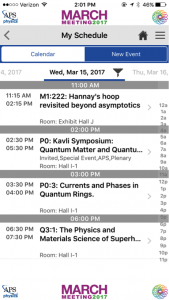 I attended a couple of smaller talks, as well as larger sessions by Nobel Laureates and the author of the Physics of Superheroes James Kakalios. Most of the physics was beyond me, and I could not even understand the questions that people were asking the presenters, but it was still great to see how the researchers in the field were interacting, and the wide range of topics open to pursuit. My favorite talk was the Physics of Superheroes, which included such sensitive questions such as which comic universe is more scientifically accurate, DC or Marvel. 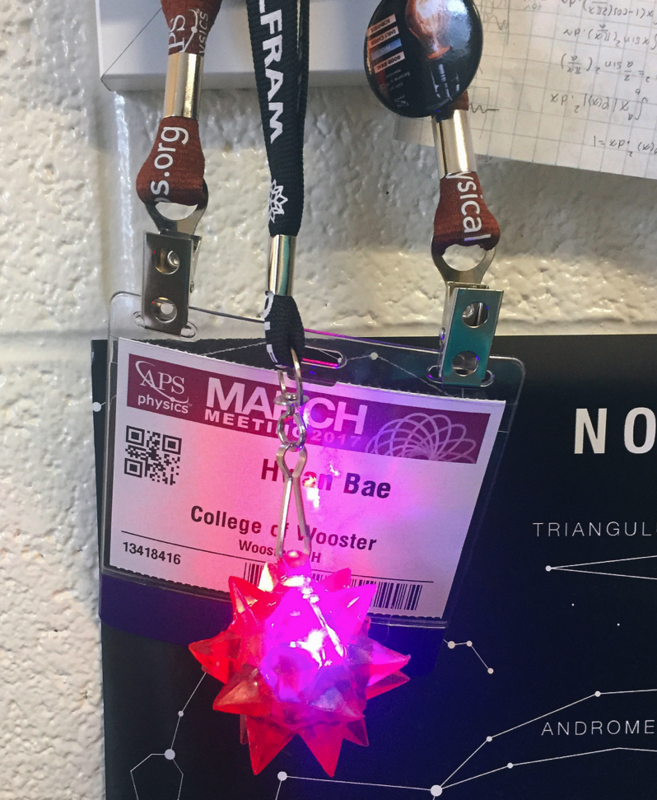 A more personal memory from the conference, we picked up these lighting up toys from the Mathematica booth. My dad and grandfather used to bring back little toys like this from the conferences they attended when I was younger, so me bringing back a memento from a conference I attended makes it feel official. I am still not 100% over the trip. 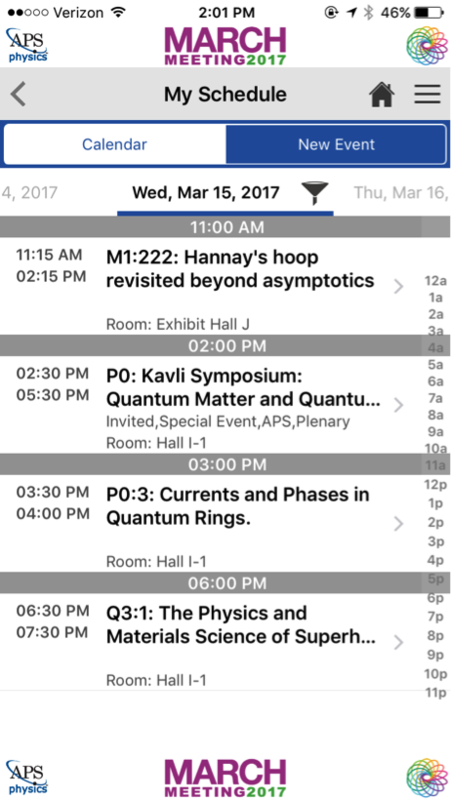 A part of me is still at the conference, with the excitement, the thousands of people at one large convention center all for one purpose of exploring physics. I would encourage anyone who is interested in their field, to attend the meeting and present their work, even if they are shy like I am. Attending the March Meeting has been a great experience and I look forward to attending the meetings to come. 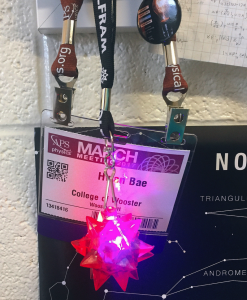 This entry was posted in Adventure, Physics, Students, Travel, Wooster. Bookmark the permalink.